This marriage is strictly business... until the temptation gets way too real. Stacey Lynn dives in with a romance that forces two strangers into a marriage arrangement that benefits them monetarily but turns into so much more. After Teagan is blindsided by job loss and a cheating boyfriend, she literally runs into rich, handsome Corbin Lane. Corbin has just learned the terms of his beloved grandmother's will. In order to inherit his safe haven, her home in Cannon Bluffs, he must marry within six months. Getting his car run into by Teagan is kismet because she has no home and needs money, and Corbin needs a wife. They both know it's crazy but once the ball gets rolling the two only have to worry about the chemistry sparking between them. 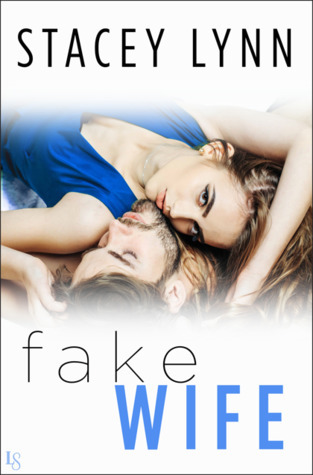 Fake Wife changed my perspective of the fake wife trope. It's so excellently written and I haven't read any similar books that top it! Teagan and Corbin are such realistic characters. When they made mistakes I wanted to yell at them until they worked out their problems. There's actually a scene where Teagan and Corbin experience miscommunication and everything almost falls apart, but Teagan thinks it through before leaving. That was so unexpected because sometimes our heroines are irrational and make hasty decisions. Teagan, though, is the kind of heroine I would like to see more often, a little more rational and less dramatic. I definitely can't wait for the next book in the Crazy Love series, Knocked Up!